Razer has added the wired ManOWar 7.1 surround-sound variant to its roster. You can preorder it now from Razer for $120, and it’ll ship in October. Unlike the wireless version, this variant works with any console or device with a 3.5mm analog port, but it also comes along with a USB digital-to-analog converter (DAC) to get the best sound for PC and Mac gamers. It comes out with 50 mm drivers to deliver virtual 7.1 surround sound to the listener. The cable also has controls right on the line so user can mute and control the volume without having to fiddle with software. The Razer Synapse configuration software enables you to customize the sound. It is also equipped with sound isolation technology, while in-line volume controls and also a retractable MEMS boom mic offer a streamlined gaming audio experience. An included USB digital-to-analog converter (DAC) enables the Razer ManO’War 7.1 to deliver crisp, outstanding audio on PCs. The pure analog connection (3.5mm audio jack) provides universal compatibility for Xbox One. Interested? If so, you can pre-order the Razer ManO’War 7.1 for $120 at Razer’s website now. 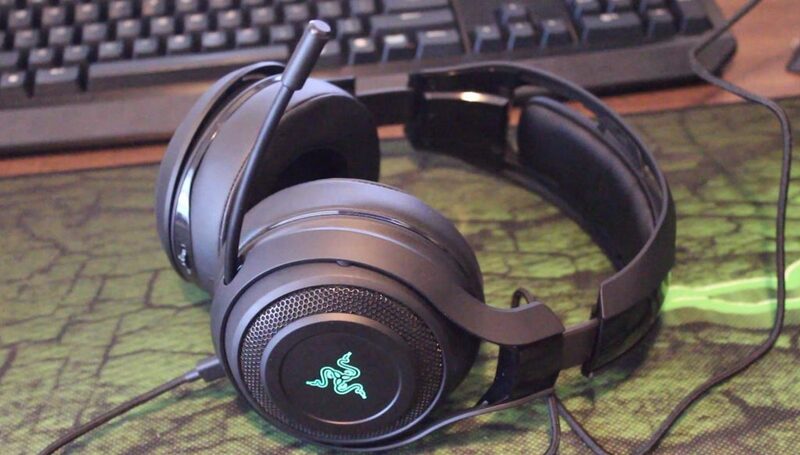 The headset is available in a standard fully black color scheme, as well as a limited version with the Razer’s trademark green accents. In Simple Word, the ManO’War 7.1 brings more versatility to what is already one of the most comfortable and the great-sounding headsets I have used recently. You’ll get the same huge, lightweight frame and cushy earcups, as well as a retractable boom mic that you can hide when you’re gaming solo. New to the ManO’War 7.1 version are inline controls on the headset’s wire, which let you adjust volume and mute yourself.